Congratulations to Jenny Dance and the Phona team whose Say It! 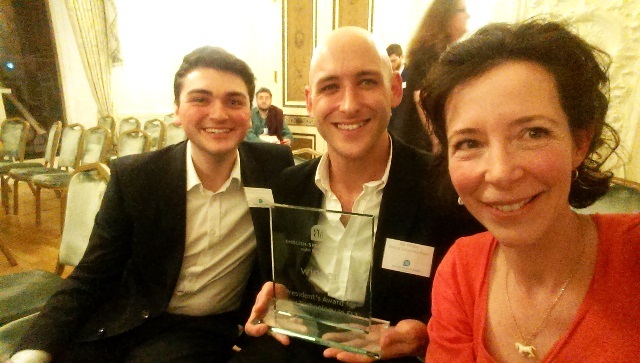 app won the President’s Award for New Technology in ELT’ at the English Speaking Union’s 2016 awards ceremony. Jenny is a graduate of our Healthcare Innovation Programme and has received support from our enterprise team on developing the app, originally designed for foreign language students, into a speech therapy tool. She is currently working with our Design Together, Live Better initiative to get feedback from speech therapists on the new product concept. The English Speaking Union’s English Language Awards help to celebrate and reward innovation and good practice in the field of English Language and English Language teaching. The ceremony was held at Dartmouth House in Mayfair and Phona won against a shortlist featuring two BBC websites and an online English course from Cambridge University Press. For the full list of award winners visit the ESU website.